Surviving Through Poetry Event a success…read coverage here! November 8’s Writing Down Cancer, Surviving Through Poetry event at the Redwood Library was a success, and the Newport Daily News‘ Joe Baker wrote all about it. At the even, Carol Anderheggen presented work from her new book, Writing down Cancer, a journey of dreams and nightmares; her reading was accompanied by fellow poet David Dragone on violin. I also read a couple of my pieces. 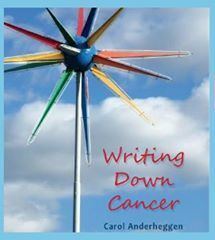 I’ll be emceeing (and reading some poetry) Sunday, November 8, when Carol Anderheggen presents work from her new book, Writing down Cancer, a journey of dreams and nightmares. Carol’s reading will be accompanied by fellow poet David Dragone on violin. The event will take place from 2:30 – 3:30 pm at the Redwood Library & Athenaeum at 50 Bellevue Avenue, Newport, RI. For more information, visit http://www.redwoodlibrary.org/programs/2015/10/07/writing-down-cancer-surviving-through-poetry or call 401-847-0292. Off the Lip feature in Wednesday’s Mercury!